Pregnant women who continue to be active are helping put to rest the enduring sexist notion that pregnancy is a malady, weakness, or condition. This morning I walked to the grocery store — a two-mile round trip, pushing Seamus in the stroller and moving at a good clip. On the way home we were weighed down by a gallon of milk and other groceries. It was a lovely fall day, and he slept the whole way, his hand stuck in a cup of cheerios. In the afternoon, I transplanted hostas, pruned bushes and got the yard ready for the winter while Seamus and his dad and big sister visited the grandparents and watched baseball. At the end of the day, I felt a little tired, but like a lot had been accomplished. As my belly grows bigger, my pride at being able to be physically active grows too. So imagine how delighted and inspired I was when a friend reposted an article about Rebekkah Brunson — a WNBA power forward for the Minnesota Lynx, who dominated the court in a recent game while eight months pregnant. As I read beyond the first few paragraphs, the story got stranger and stranger, with timeouts for hot dogs, lactation emergencies and crying jags. Finally, I checked the source of the article: The Onion. It was pure fiction. What a bummer! 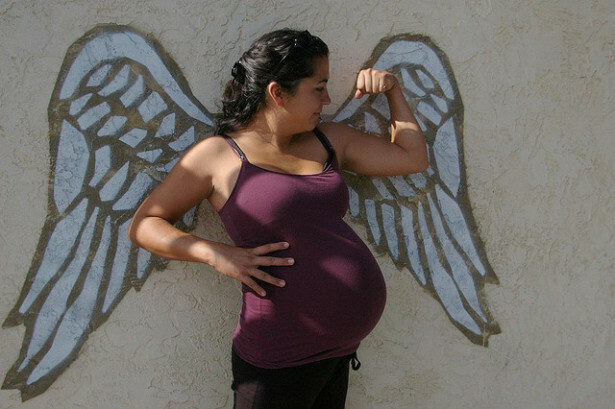 But it got me thinking about pregnant women continuing to be active and physical and strong even as they are putting so much energy into growing and nourishing new life. Athletes, politicians, performers, normal Janes: Women get pregnant. Model Alessandra Ambroisio hid her pregnancy so she could walk the catwalk for Victoria Secret in 2011. She looked great (in a Victoria’s Secret sort of way, but she was only two months pregnant and hit the gym hard for the few weeks beforehand). Raquel Batista isn’t hiding. The lawyer and community organizer from the Bronx is running for New York City Council and gave birth to a baby girl in August. Sally Kohn of The Daily Beast asked if there is a “broken-water” ceiling where women are penalized by voters for being pregnant. She wrote that throughout her campaign, “Batista’s pregnancy was never seen as a positive — a sign that if she would fight this hard to get into office while pregnant, imagine how hard she would fight for her constituents while in office.” It was always a problem: Who is going to look after the kid? Can she keep up? Isn’t she uncomfortable? Election Day is just a few weeks away, and I hope voters will make their decisions based on Batista’s record and platform and her gumption for throwing her burp-cloth gauntlet into the political ring. And then there is Sri Lankan performer MIA, strutting and dancing in a tiny polka dotted “dress” on her due date at the 2009 Grammys. She performed her song “Swagga Like Us” alongside Jay-Z, Kanye, Lil Wayne and T.I. — and she nailed it, not to mention that she looked as though she was having the time of her life. She gave birth to her son Ikhyd days later. The strangest thing about being pregnant is how conspicuous you are — how often strangers talk to you and ask you questions. It is like wearing a big sign all the time, in a good way. My experience is that pregnant women make people happy. We are visible, so we might as well make the most of these nine months. The fact that pregnant women are running, rapping, dancing, giving speeches, and wielding paint brushes on top of step ladders helps to put to rest the enduring sexist notion that pregnancy is a malady, weakness, or condition. We resist — with our brawn and bulk, our hormones and our harried-ness — patriarchy’s compulsion to shut us away to worry over the nursery and do kegels. We are here and we are growing the next generation — get used to it and get to work making the world worthy of our children. They call Rebekkah Brunson “the machine.” Her hard work, consistency and skills just helped land Minnesota the WNBA championship. But, no, she is not eight months pregnant. I am no power forward. Heck, I don’t even know a dunk from a duck, but halfway through pregnancy number two, I do feel powerful. I’m less fearful, less tentative, and less rule-bound this time around, but no less stunned by the strength of the pregnant body. All the preggies put your hands up, now let’s do some push-ups! I love this video by Walk Off The Earth, in which singer Sarah Blackwood is super pregnant. The best part is that the song is “Material Girl,” but she’s wearing overalls and a t-shirt with her belly! FRIDA! You are wrong! The material in THE ONION is all factual and backed up by credible sources! I’ve been reading it for years, and it is much more truthful than the Sunday New York Times! Hi Ho!! !